Online gaming and platform supplier, Relax Gaming, has announced yet another new online slot game release. 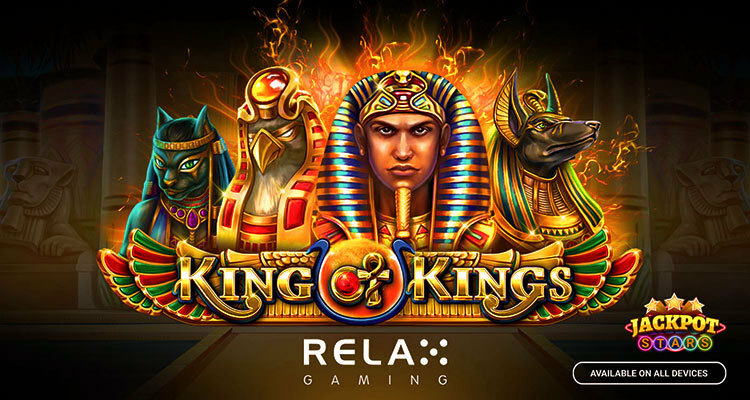 King of Kings takes players on an epic Egyptian adventure, featuring a 3×5 grid that includes the pharaoh, gods and jewels. Players will be transported into the high society of Egypt as they spin the reels of this new game. In this new title, players will find added features that ramp up the excitement. Jackpot Stars is a randomly triggered side game where users have the opportunity to place a side wager, which provides the opportunity to win a jackpot worth as much as 12,500x the bet! CPO, Simon Hammon, commented on the new game by stating: “Relax Gaming’s slot portfolio has a firm grounding in expertly modeled mathematics and core gameplay, enhanced with truly engaging bonus or side features. King of Kings is another new format for Relax’s library that delivers on this philosophy. The supplier has been busy working on other areas of their business aside from the launch of this new game. The company announced in March that they had partnered with Videoslots, an online casino brand. With the commercial deal, Relax will be providing their portfolio to the players of the online casino. The terms of the deal include several slot games for Videoslots including Zombie Circus, Epic Joker and Temple Tumble.